Set on five tranquil acres, Tarcutta Halfway Motor Inn offers all of the comforts that weary travelers require to relax and unwind. Now set away from the Highway a restful nights sleep is assured. The Motor Inn has ample parking for caravans and trailers. Our 25 prestige and inviting, air conditioned units are constantly maintained to the highest standards, and are available to cater from family and business travelers, right through to coach groups. 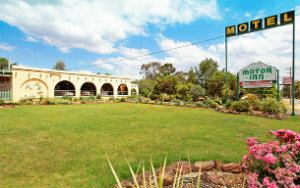 The main features of the Tarcutta Halfway Motor Inn that set us apart from the rest are our animal stables,beautiful gardens and restaurant.